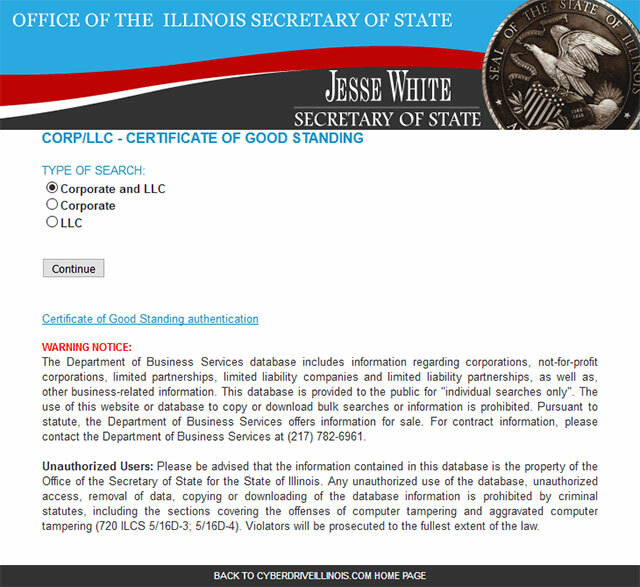 The Secretary of State of Illinois maintains one of the country's largest databases which contain information on hundreds of thousands of business entities, primarily including Corporations and Limited Liability Companies (LLCs). 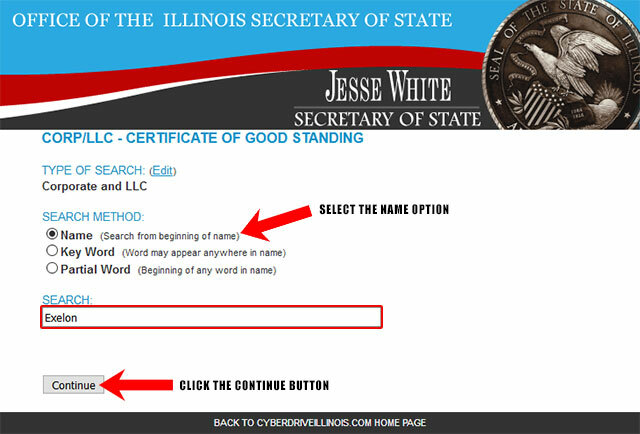 Below is a step by step guideline on how to use the Illinois business search page. 1. The first step is to go to the Illinois business search page by clicking here. (it will look like the screenshot below). On this page you will need to choose what type of business entity you are searching for. In this example, go ahead and select the option "Corporate and LLC". 2. Once that is selected click the "Continue" button. On the next screen you will need to choose one of the search methods available. For this example go ahead and choose the search method "Name" and type in the "Search" field "Exelon" and then click the "Continue" button. 5. The Results Page will then appear (see the screenshot below for reference). Click on the business entity's name to access more information including its File Number, Status, Entity Type, Qualification Date, etc. 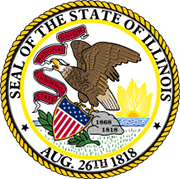 As the second largest constitutional office of the state, the Secretary of State of Illinois is also an elected governmental institution. The Secretary of State of Illinois is a government office visited by more Illinois residents than any other government office in the state. 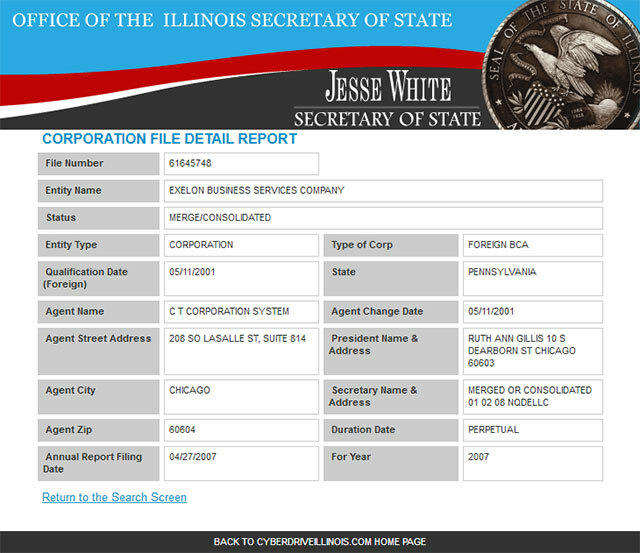 Jesse White, a Democrat, has been the incumbent office holder since 1999. The Secretary of State of Illinois is the custodian of the public records and archives, state laws, state records, State Capitol and Library. 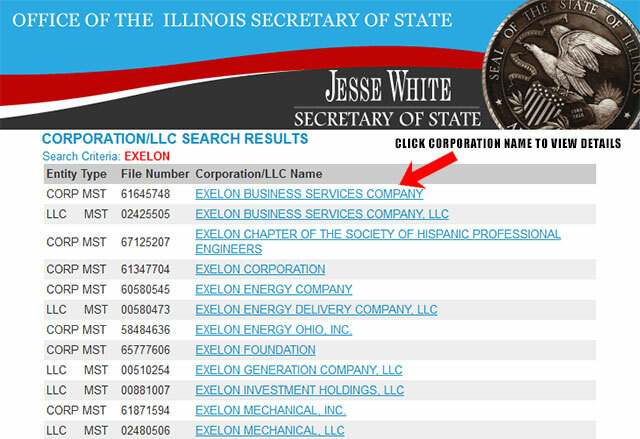 Aside from registering corporations, lobbyists and notaries, he is also in charge of issuing licenses to Illinois-registered vehicles and motorists.